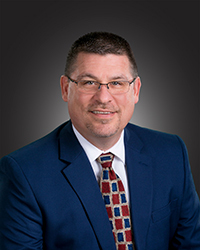 Pinckneyville Community Hospital is pleased to announce that Brad Futrell has been named Chief Operating Officer (COO). "Healthcare is rapidly changing. Each of these changes comes with regulations. This new executive position will function as oversight of different areas within the hospital in order to maintain compliance with these changing regulatory standards," states Randall Dauby, Chief Executive Officer. "The position will also provide assistance with the coordination, evaluation and recommendations of strategies to improve efficiency in operations." "I've witnessed first-hand that Brad has a great understanding of what rural hospitals need to accomplish in order to adapt to these changes, while continuing to impact the health of the community." With over 20 years of healthcare leadership under his belt, Futrell notes that he is "honored and excited" to join the Administrative Team at Pinckneyville Community Hospital, as the organization continues to grow and adapt to the changing healthcare needs of the community. "I have interacted with members of the leadership team in different capacities through the years and they each are recognized as leaders in their respective fields." Futrell has worked closely with Dauby in the past, as they worked together for nearly 20 years at Hamilton Memorial Hospital. "I truly respect his guidance and leadership," says Futrell. "Randy is a visionary leader who is respected throughout the state for his contributions to rural healthcare and I am honored to get to work with him again." Futrell has most recently served as the Associate Chief Executive Officer of Crossroads Community Hospital in Mt. Vernon. As a lifelong resident of southern Illinois, Futrell has a clear understanding and appreciation of 'small town' living. "I believe that the best thing about small towns is the people. This region is blessed with hard-working people who are committed to making this area a great place to live." "Critical access hospitals, such as Pinckneyville Community Hospital, truly make a difference in the communities that they serve," remarks Futrell. "When healthcare is delivered in rural communities, I believe patients truly feel the compassion and concern that comes through that care, helping to form a bond between the community and the hospital. Patients and their families know that the hospital is genuinely concerned about their health and wel-lbeing." Futrell resides in McLeansboro with his wife Cathy, and their two children, Grace and Aden. In his free time, Futrell can be found attending sporting events, running or cheering on the St. Louis Cardinals.